A professional irrigation evaluation will gather extensive system operating pressure and emitter discharge rate information. System operating pressure information is important since the discharge of many microirrigation emitters is pressure dependent. That means that when the operating pressure goes up, the emitter discharge rate also increases (see Figure1). Exceptions are microirrigation systems with pressure compensating (PC) emitters. 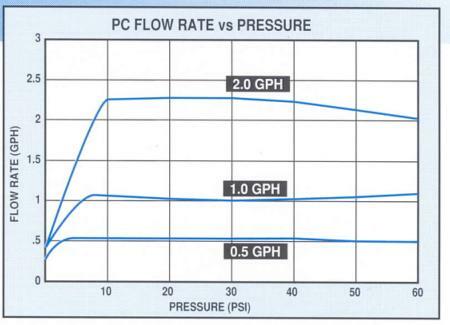 These PC drip or PC microsprinkler systems discharge at a constant rate across a range of water pressures (see Figure 2). Figure 1. 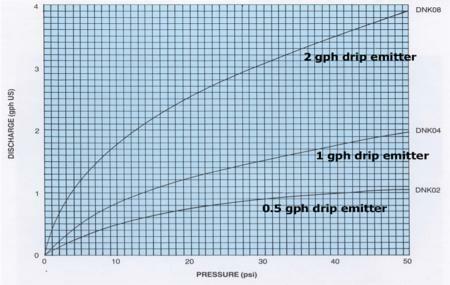 Discharge vs. pressure for drip emitters with no pressure compensation. Operating pressures vary throughout a microirrigation system due to elevation changes and the friction that occurs when water flows through pipes and tubes. These variations in operating pressure may result in variations in emitter discharge rates. As part of a professional evaluation, emitters throughout the system will be sampled for discharge rate. Water from each selected emitter will be collected for a set period of time and the individual emitter discharge rate determined. What information should you receive from a professional irrigation evaluation? First, you should get a clear accounting of the distribution of operating pressures in the system (for example, pressures at the head of the system, the tail end of the system, the heads of the lateral lines, and the lateral ends). Second, you should receive the emitter discharge rates, referenced by where they were collected in the field. Based on these individual measurements, the evaluator should also provide an average emitter discharge and a measure of the emitter discharge variability, most often the distribution uniformity (DU), also known as the lower quartile distribution uniformity or sometimes as the field emission uniformity.